This post is sponsored by Pacific Foods, a brand I’ve loved and used for many years! Thank you for supporting the brands that keep The Kitchen Paper up and running! Happy Sunday, everybody! I’m here on a Sunday because I’m gonna be cooking this recipe LIVE ON FACEBOOK TODAY! Aaaah! I’m nervous. Tune in at 11am PST to see me look real awkward and weird — and grab your groceries for this soup before then if you want to cook along! 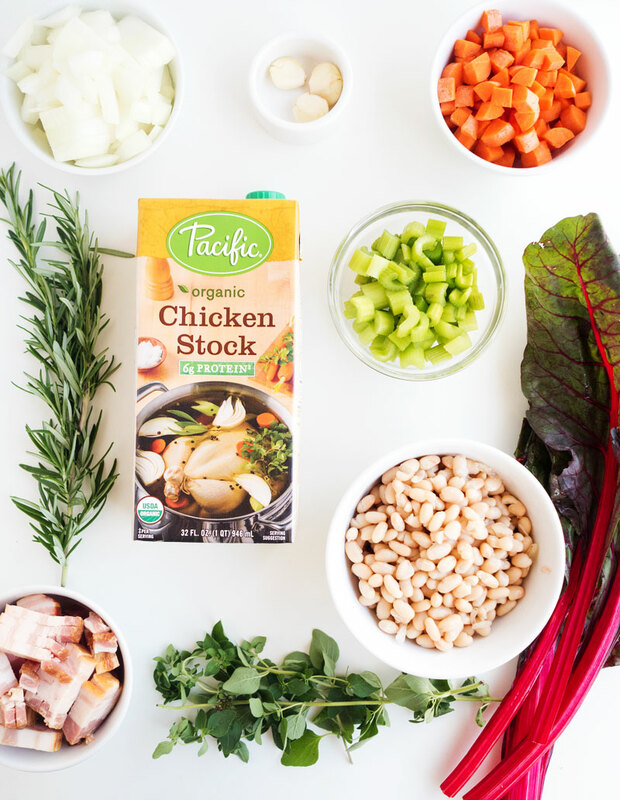 You can also enter Pacific Foods’ Soup Series giveaway and win an assortment of broths, and even a Le Crueset stock pot! AH! 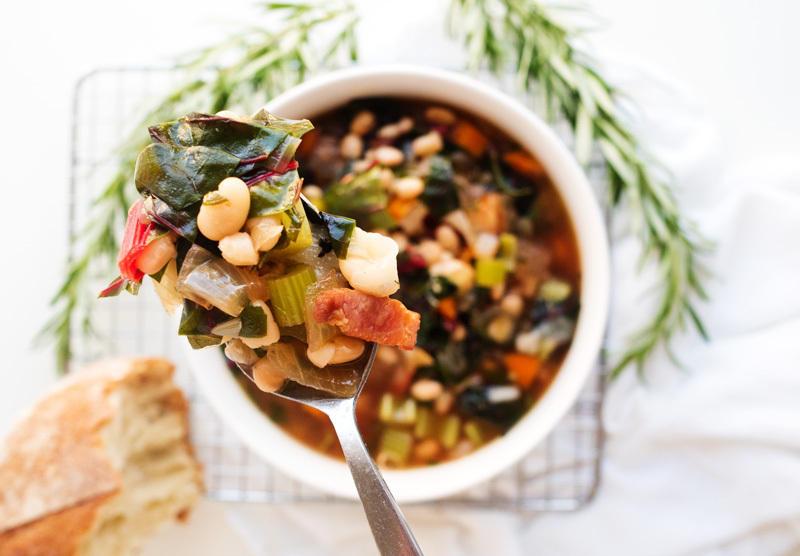 This is a classic white bean soup, packed with veggies, flavored with some bacon, and altogether really quick to make. 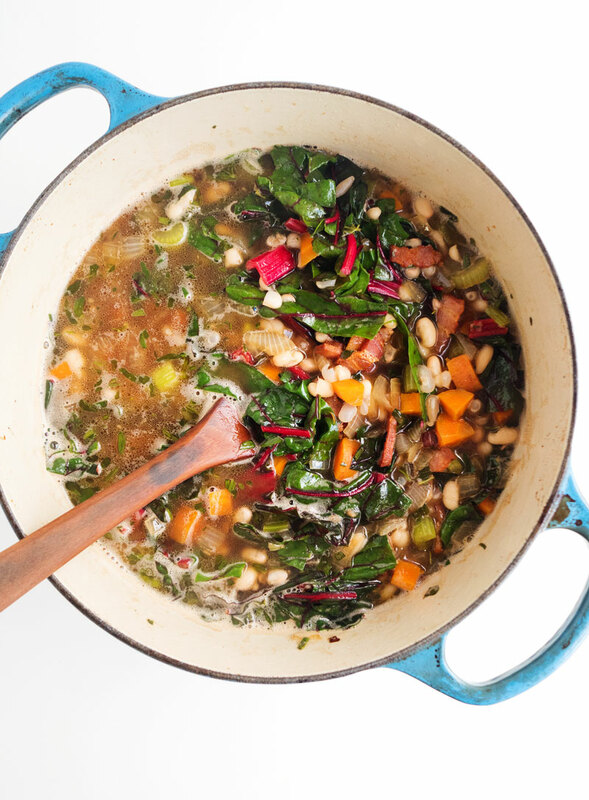 You can also spice this soup up with some crushed red pepper flakes, if that’s your style!! 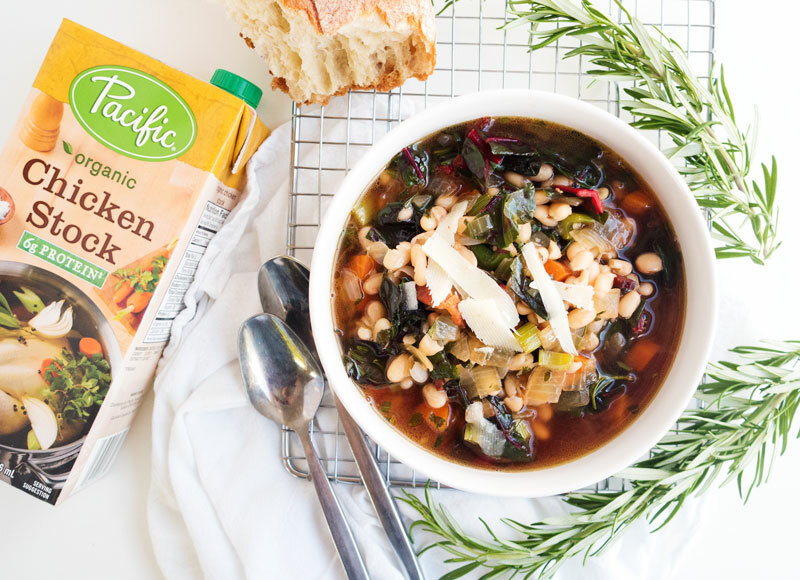 Apparently Portland is getting hit with an “atmospheric river” right now — I’m pretty sure that’s just a fancy word for ALL THE RAIN — so this soup is perfect for snuggling up, keeping warm, and also getting your veggies in! See you all on Facebook at 11am PST! 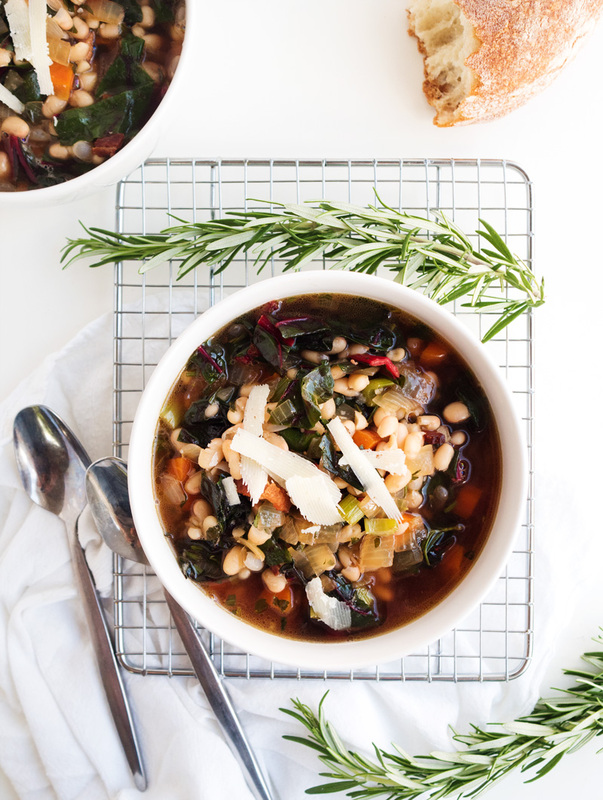 This classic white bean soup comes together quickly with pre-cooked beans, and has tons of flavor from bacon and vegetables! In a large soup pot over medium heat, cook the bacon pieces until they’re crispy. Use a slotted spoon to remove the bacon, leaving the grease in the pot. Add the onion, celery, and carrot, and use a wooden spoon to scrape any remaining bacon from the bottom of the pot. Cook for 3 minutes, then add the oregano, rosemary, and garlic. Cook for another minute before adding the Pacific Foods Organic Chicken Stock. Bring to a simmer, and add the beans. Let the mixture simmer for 10 minutes, then add the chard or kale. Remove from heat and stir the greens in until they’re fully wilted. Season with salt and pepper to taste, and serve topped with shavings of parmesan. Good. Appears from the picture that you put the bacon back in though, so you should probably mention that.